It’s hard enough for us to remember to take our keys every time we leave the house, but also remembering the numeric combinations for combo locks? Out of the question. We usually end up either putting the combination on the back of the lock or eventually breaking the thing when we can’t remember whether that was supposed to be an 11 or a 17. The Image Lock is a quirky way to secure your stuff without the pressure of memorizing combinations (which are basically just more passwords on top of all of the digital ones you already have to remember). 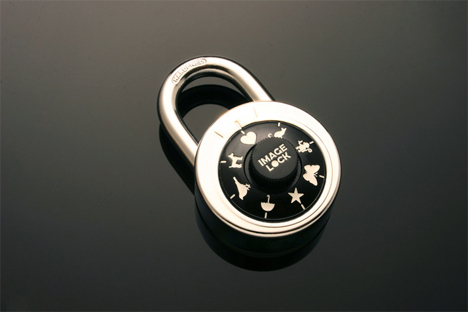 Instead of using numbers to unlock, the Image Lock uses – you probably guessed this already – images. So instead of remembering random strings of numbers, the combination for your tool shed is Star-Monkey-Chicken, and the one to open your bike is Heart-Umbrella-Heart. Ali Nawaz is the former US Marine who invented the Image Lock. On the front lines in Afghanistan, he saw a need to physically secure items but noticed how hard it was to remember multiple numeric codes. He figured the Image Lock could make life a little simpler since you could even make up a little story to go along with the pictures in your combination. The Image Lock hit up Kickstarter for initial funding and just barely met its goal, meaning that the cool low-tech password-overload solution should be available for purchase soon.